(Tim Schraeder). Center for Church Communication, 2011. 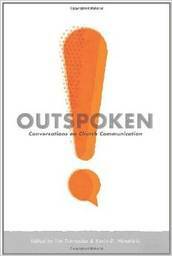 Church communication specialist and co-editor Tim Schraeder says Outspoken is a “collection of thoughts, ideas and principles that are shaping and inspiring the way some outspoken church communications leaders are leading communication in their churches.” Schraeder starts with the idea that Christians have a great story to tell, but that most often the story is not communicated in the most effective way. Schraeder and company seek to change that by helping the church make all of its communication “outspoken” and clear. To that end, this book contains sixty-nine brief articles written by more than sixty authors who share their experience, wisdom, and ideas about communication and the church. The articles address a variety of subjects. This includes the importance of presentation, the use of technology and its relationship to the church, communicating in context, and personal development and communication. A few other topics addressed include branding, advertising, outreach, and the use of story. A variety of Christian traditions will appreciate the book’s perspective. Ultimately, Schraeder and Hendricks’ goal is for Christians to raise the level of their communications that others will be able to hear the greatest story ever told.